The PSM provides advice on a range of non-clinical topics together with supporting tools, including template forms, information sheets, policies and checklists, to aid implementation. Although the PSM is written primarily for principal dentists and practice managers who are responsible for managing a dental practice, the smooth running of a dental practice involves, and depends on, the whole team. Therefore, the content is of relevance to all members of the dental team, and all team members are encouraged to read the PSM. Checklists are provided to facilitate allocating responsibilities among the dental team, which might help to improve the efficiency of running a dental practice. To access the full content of the PSM website, please create an account via the link on the homepage. A video introduction on how to access and use the PSM is provided. 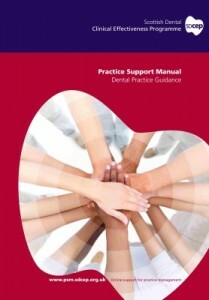 Currently the PSM is freely available to the dental profession in Scotland. If you do not work in Scotland and are interested in accessing the PSM, please contact the SDCEP office.